What ensued was a shocking debate – followed two days later by a vote – that revealed not only the lengths to which Deputies Clare Daly and her colleague Mick Wallace are prepared to go to in order to minimise the crimes and atrocities of the Assad regime but also a willingness on the part of other Teachtaí Dála to row in behind Daly and Wallace on this issue. It also the exposed the empty rhetoric of the government which claims to be standing by the long-suffering people of Syria whereas, in reality, it does far too little to protect civilians from years-long campaigns of starvation sieges, chemical weapons attacks and mass bombings by the Assad regime and its allies. Please see the response of the Irish Syria Solidarity Movement to this sorry state of affairs which was sent to all members of Dáil Eireann. FORCED DISPLACEMENT: Deputy Clare Daly euphemistically concludes: “Much of Syrian territory has been retaken and is being rebuilt…. 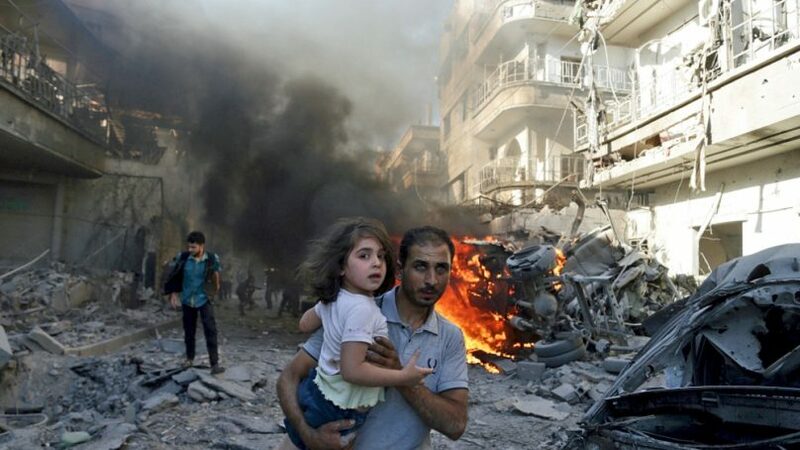 What the Syrian people want is assistance to rebuild.” But there is no apparent recognition of what the regime’s “retaking territory” has entailed – After the barrel bombs and starvation of Syrians in besieged regions, the devastated population has no choice but to leave.